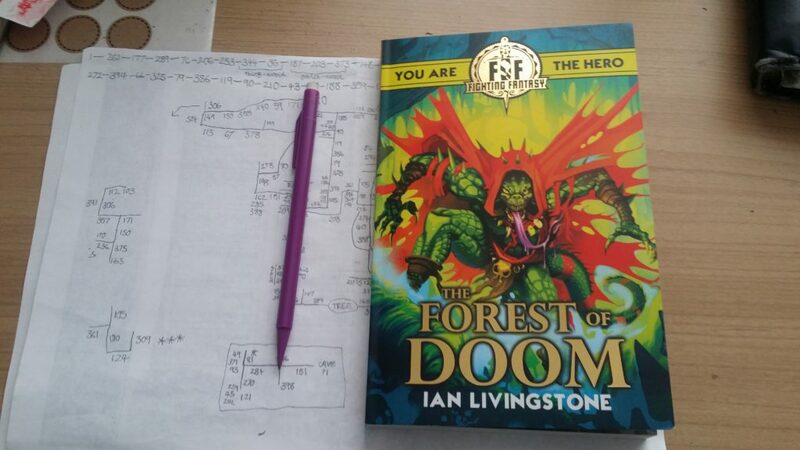 After playing the latest Fighting Fantasy release, “The Gates of Death”, and really enjoying it, I decided to revisit one of the classic early titles, and “The Forest of Doom” was an obvious choice – this was my introduction to the series, way back when it was first published in 1983. I was nine years old at the time, and my primary school teacher – a rather scary older lady who wasn’t particularly down with the kids – introduced the books to the class in a rare display of cultural relevance. I borrowed a copy from the school and attempted to play it – I certainly didn’t solve it at the time and lacked the attention span and patience to make a decent stab at it, but it was enough to make me enjoy playing these books, and I played quite a few others over the next few years. So – how was it thirty-five years later? Pretty good, I reckon! It seems this isn’t considered one of the better titles, but once again I found it quite engrossing, and it’s very easy to lose yourself in it and really enjoy playing your way through. The plot of the book is that you have to find the two parts of a legendary Warhammer, and return them to the dwarf village from where they were stolen. You start off with the option of buying a range of potions and other items that will help you in your quest – you certainly can’t afford all of them and it’s not clear what ones you’ll need. In the cases where you get to use them, they’ll make life much easier but the alternatives aren’t usually fatal if your stamina score remains good. Equipped with your items of choice, you’re off into the forest. Apparently there is “one true path” through it, but you don’t have to discover it straight away to be successful. The gameplay is essentially a maze, with a network of paths that join up in various places, and a range of off-path locations that you will need to explore to be successful. Do yourself a favour and attempt to map your progress, or at least record where you’ve been – if you don’t, you’ll really struggle to find your way around and risk repeating large sections on later attempts. You’re very rarely given the opportunity to double back on yourself, and whichever route you take, you’re eventually forced northwards to the edge of the forest, ending up in the same location, where you win if you’ve successfully found both parts of the hammer. If you haven’t, you’re rather unusually given the chance to make your way back to the start and try again, with your same character. This is certainly worth doing if you still have a reasonable level of skill, stamina and luck, and if you’ve found any gold along the way, you can stock up on magical items again before taking a different path. On my first attempt, my first circuit of the forest failed to locate either part of the hammer, but I found one part on my second circuit – sadly I was killed in battle before I could find the other part. On my second attempt, I repeated the steps that led me to find the first part of the hammer, and then ended up on a second circuit before I found the other part very close to the end. This time I was able to successfully avoid the parts I’d already explored. You’ll end up fighting a LOT of battles to get through this, and although most creatures aren’t very challenging to fight, there’s a risk it’ll hammer away at your stamina enough to drastically increase your risk of death before successfully completing the game. Unfortunately very few creatures turn out to be worth fighting or trusting, but you’ll not know which ones they are the first time around! There’s various items in the game that will either enhance or hamper your ability to fight, and that can make all the difference. You can cheat a bit to make it easier to finish, but at the end of the day there’s a reward to being patient enough to do it properly, and it’ll greatly increase your enjoyment and satisfaction when you do solve it. A particular criticism I have is the presentation of the Scholastic re-issues, which sadly are nowhere near as attractive as the original Puffin versions. These had much higher quality proper fantasy art in them, and the typeface and presentation was of a much higher quality. The new ones look a bit cheap in comparison, and that’s a shame. Essentially, though, that’s not really much of a distraction – the point of the book is playing the game, and there’s much satisfaction to be had from doing that.